Bighill joined the Bombers on May 19, 2018 and his impact was immediate. He recorded 105 tackles while adding four sacks, four tackles for loss, a fumble recovery, two interceptions (one returned for a touchdown), and a league-leading four forced fumbles. His 127 defensive plays were the third-most in the league last season. He was not only named to the West Division All-Star Team for a sixth time, but was selected to the CFL All-Star squad for a fifth time and was honoured as the league’s Most Outstanding Defensive Player for the second time in his career. 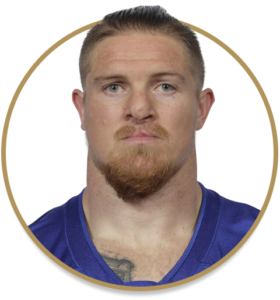 On January 15, 2019 Bighill signed a three-year contract extension to remain withe the Blue Bombers. Bighill signed a reserve/futures contract with the Saints on January 4, 2017. After standing out during training camp and in the preseason, Bighill was able to dress for three games for New Orleans before being released on May 14, 2018. Bighill suited up for six seasons with the Lions, recording 509 defensive tackles, 70 special teams tackles, eight interceptions, eight forced fumbles and 33 sacks in 99 career CFL games (85 starts). He was a four-time CFL All-Star and five-time West All-Star with the Lions and was a member of their 2011 Grey Cup championship team. In 2015, Bighill led the CFL with 117 tackles and was named the league’s top defensive player. Bighill was twice named the Lions Most Outstanding Player (2013, 2015) and was honoured as their Most Outstanding Defensive Player on three occasions (2012, 2013 and 2015). Starred at Central Washington from 2007-10, racking up 163 solo tackles — 46 of which were for a loss — along with 11 sacks and seven interceptions in 44 games. He was CWU’s 2010-11 Co-Male Athlete of the Year and earned a starting spot and team captaincy in the Division II All-Star Game in January of 2011. He was also named a First-Team Division II All-American.